Keep things at eye level. No one likes to bend down to read a product label, so it is important to stack product high enough that customers can see what it is without getting on their knees. With that said, be sure to stack bags at a safe level and neatly so they don’t slide around and fall over. Group like products together. 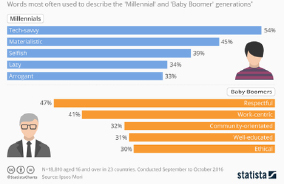 Keep similar product lines together, so customers can see the various options that are available to them. They won’t want to go back and forth between products to compare labels. Place small pack products up front. These smaller, usually less expensive items sometimes get left behind in the stacks of 50-pound bags and tubs. Place smaller items up front and train employees to suggest them as customers are checking out, especially if they complement other items customers are buying or are in season. Is it calving time? Be sure to suggest some Vita Charge® Neonatal or Vita Charge Paste. If it is the summer show season, and a customer is buying Sure Champ® keep Climate Control near the counter, and remember to suggest they add a few tubes of that to their order. Displays don’t have to be extravagant to be eye-catching. Some signage is nice, but flashy neon signs and streamers aren’t necessary. Contact Kristi Stevens, Marketing Project Manager at (816) 596-8795 to order pre-designed, eye-appealing signs with the brand logos on them to hang above products your store offers. These vinyl signs are easy to clean, easy to read and will lead customers to the products they are looking for. Add product information to your displays. Information is power, and it is always a good idea to add support materials like a product brochure or spec sheet close to the products you have on display. 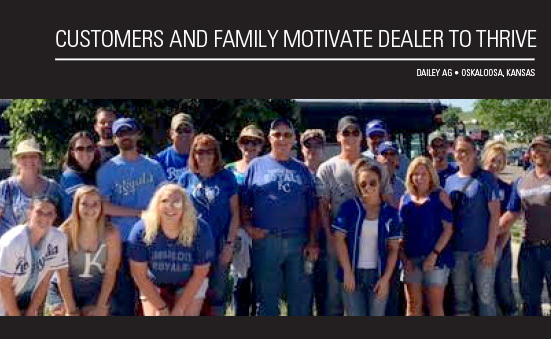 You might be busy with another customer, and the brochure might have just the information a customer was looking for to make the decision to buy the product. Be sure to add any special pricing or promotions. Once again, signage doesn’t have to be extravagant, just easy to read with a clear message. Display at least one of every product you offer. You might not have a large area to bulk stack multiple bags of the same product. Then use a table to put out one of each product or literature on the products you do have available. If the customers don’t know you have it, they can’t buy it. Making an effective display takes time and energy, but it doesn’t take an advanced degree in artistic design or carpentry. Use the resources available to you, make it easy to see and add signage and supporting materials to provide information. Keep small-pack products close to the front where they can be easily discussed at check-out, and keep items out on a seasonal basis. Follow these basic reminders, and you will be able to show everyone the great products you offer. Posted on November 21, 2017 Categories 3 Keys to Better Business, Business Resources, Business Topics, Motivate, Tell Everyone! MarketingLeave a comment on Displays That Excite! Routine is a comfortable place to be. Most of us probably follow the same pattern every morning as soon as the alarm goes off, and if we miss a step, our entire morning is just off. We often sit in the same pew at church, park in the same space at work and usually order the same toppings on our pizza any time we call for carryout. Your customers probably have a routine when it comes to ordering and buying products too. But have you suggested they try something new or different? Changing a routine isn’t always necessary, but sometimes it can make life better. Most of the BioZyme® products are developed to be a proactive way to manage animals’ health and well-being. But let’s face it, animals will stress, become sick and go off feed, and when that happens their owners are looking for a quick-fix. That is where the products like Vita Charge® Liquid Boost or Paste or Vitalize® Equine or Dog Recovery Paste can help. These small pack products are easy to use, low risk and have a quick response time. Animal owners might not always think of these smaller items as time savers that can help their animals quickly, but remember good things do come in small packages. If you have these small pack products on-hand, but don’t feel like your customers know the benefits of using them or if they even exist, it is time to get creative in your education and marketing efforts. Consider bundling like-items together for a slightly reduced price. You might bundle a tube of Vitalize® Equine Recovery Paste with the Vitalize High Performance or Vitalize Protein Pellets. Is it summer show season in your area? Bundle a tube of Climate Control with Sure Champ®, and ask your customers to report back to you with the positive results they have experienced after trying Climate Control. In addition to bundling the products for a reduced price, be sure to display the small pack products in a prominent location. 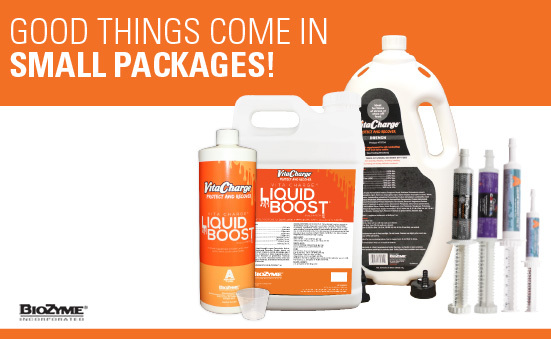 If it is farrowing, lambing or calving time, you could create a catchy display that features the Vita Charge® line: Liquid Boost, Recovery Paste and Neonatal, all near the front of the store. Be sure to have some point of sale information close by, and make sure all employees know how to describe and discuss the benefits of the products. Offer a promotion. 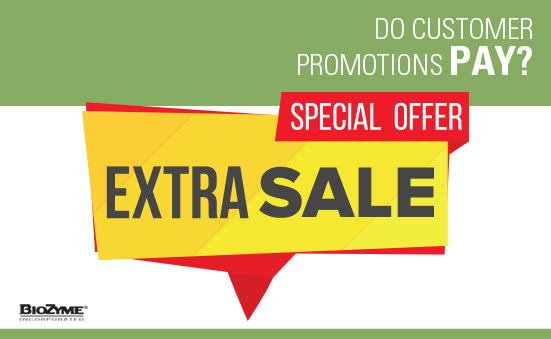 Everyone appreciates a good deal, so offer a limited time, promotion to make sure your customers know about these small pack products. This can be done several ways – online, in conjunction with an open house or producer meeting, or in-store. Be sure to put extra effort in promoting the products, their benefits and how they complement other products your customers are currently using. Finally, as the dealer selling these products and helping your customers, you are also helping your bottom line since these products also offer a higher profit margin. It might seem more advantageous to sell Stress Tubs and 50-pound bags of supplements as we are so accustomed to focusing on tonnage, but don’t forget to suggest these smaller items to your customers too as the profit margin and benefit to your customer makes it all worthwhile. 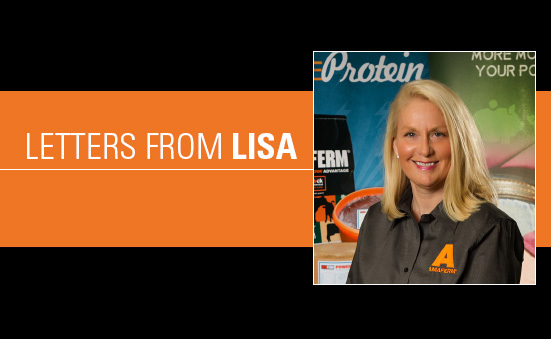 There are small products for every specie and every season, so your customers should always have some of these in their feed room. Posted on November 21, 2017 Categories 3 Keys to Better Business, Business Resources, Business Topics, Know Your Customer, MotivateLeave a comment on Good Things Come in Small Packages! Stress management is a crucial part of any productive operation. When your livestock are stressed, there can be profound negative consequences on overall herd health and efficiency. Without proper management, not only will the animal’s well-being be compromised, but also the producer’s bottom line. Therefore, swift and effective management decisions are crucial to keep long-term effects of stress at bay. BioZyme® is dedicated to offering a line of products that can help producers protect their livestock from stress or aid them in recovery from those stressors. 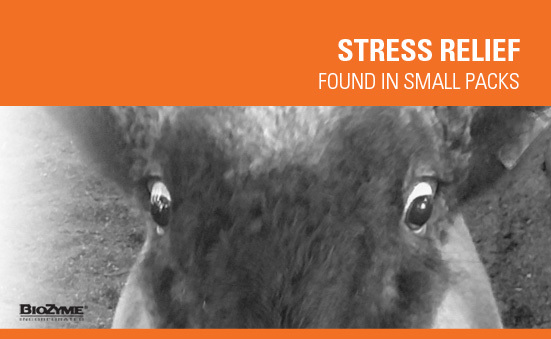 So what causes stress in livestock? Any internal or external environmental stimulus that is outside of an animal’s “normal” routine can trigger a stress response. Many common stressors in production agriculture and performance animals include: parturition, weaning, severe weather extremes, transporting, significant diet changes, sickness or spending time on the show road. These stressors can disrupt normal metabolic functions, inhibit normal hormone responses or even impact animal product quality and safety. Management of stress in livestock is achieved through the controlling of the cause of stress and management of the effects of stress. Both can involve nutrition. Although many stressors, such as weaning, can’t be eliminated, BioZyme’s Vita Charge® brand and select Vitalize® products help producers become better equipped to handle stress through enhanced nutrition. These products have made such a large impact for the simple fact… THEY WORK! 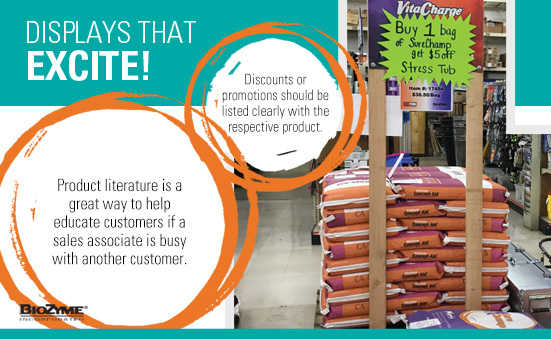 Here are the main reasons why you should incorporate Vita Charge and Vitalize products as an integral part of your business. BioZyme’s small pack products contain powerful doses of vitamins, trace minerals and the Amaferm® advantage. These nutrients are advantageous in stressful times when livestock need protection or assistance in recovery. When an animal is stressed, trace mineral and vitamin requirements are elevated. When these requirements aren’t met, animals tend to show the effects of stress by going off feed, showing poor conversion or even falling ill. Vitamins, specifically B vitamins, found in the Vita Charge and Vitalize products encourage improved feed intake; while Amaferm® helps multiply good bacteria present in the digestive system. In addition to vitamins and Amaferm, Vita Charge Liquid Boost® and Stress Tubs contain MOS. MOS is a feed additive derived from a specific strain of yeast and promotes increased animal performance through improved gastrointestinal health and integrity. MOS binds to pathogens, such as E. coli and Salmonella (bacterial causes of scours), and keeps them from attaching to the animal’s digestive tract and causing sickness and decreased performance. Because of the synergistic relationship that exists between the vitamin and mineral fortification and Amaferm, customers see a very rapid response in terms of intake and recovery from stressful events. This is due in large to the fact that vitamin and trace minerals have a profound impact on immune function, and Amaferm improves digestibility and nutrient absorption. In other words, animals can absorb more of the nutrients they need most during stress. Up to 70% of an animal’s immunity lies within the digestive tract. Therefore, when an animal feels good on the inside, they look good on the outside! there will always be a period of time where livestock (or even companion animals) will endure some sort of stress. But when you combine high quality nutritional products that are easy to use and have a rapid response rate; it’s a no brainer to recommend these products first to potential customers. These products are the quickest way to prove to someone the benefit of Amaferm and the importance of proper nutrition at the right time, as well as the easiest approach to insuring a long-term customer that will incorporate multiple BioZyme products into their feeding regimen.